Navel creation or belly button surgery is a procedure to surgically create a new belly button or modify the appearance of an existing navel. Also referred to as umbilicoplasty, it is often performed as part of a tummy tuck surgery or lower body lift and demands a great amount of surgical expertise. However, there are certain clients who come to us to have their belly buttons revised for other reasons as well. The goal of this procedure is to create a belly button that appears as close as possible to a natural belly button. The new navel will have a slightly hooded appearance and soft contours to appear natural. You don’t have a visible belly button at all. You wish to change the position, shape, size of contour etc. What happens during a navel creation surgery? 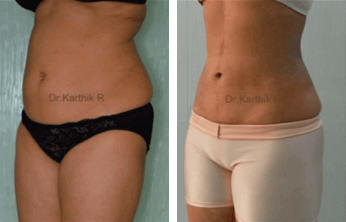 At Chennai Plastic Surgery, our cosmetic and plastic surgeons prefer to perform the procedure under general anesthesia and is most often performed as an extension of a tummy tuck. It is a very straight forward procedure that involves skin excision, followed by attaching the lower part of the belly button deep into the abdominal wall. What to expect following the procedure? Following the procedure, there might be mild bruising, swelling and pain which gradually subsides. There shall be no resulting scars as the incisions are usually tactically placed. With a progress in recovery, one can expect a normal looking, well shaped navel. Sometimes, there is a chance of losing the newly created navel to necrosis, as a result of delayed blood supply to the newly created navel. Sometimes, there are chances of excessive scar production that requires a correction later in time. And of course, as with any other surgery, there are chances of infection, which is preventable by following the precautions and choosing the right surgeon.